Turkey's first domestically-developed training aircraft Hürkuş-B will make its maiden flight with the Turkish Air Force in the first week of November, Vice President Fuat Oktay announced Monday. Oktay made the announcement on a visit to Turkish Aerospace Industries (TAI) facilities in the Kahramankazan district of Ankara for observing defense industry-related developments that are part of the presidential cabinet's 100-Day Action Plan. 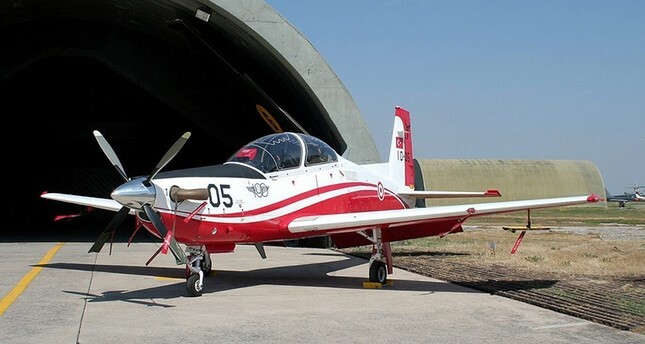 HÜRKUŞ, which was flown by TAI test pilots, will conduct its first flight with Air Force Command pilots in Çiğli, İzmir in the first week of November. Oktay, the coordinator of the presidential cabinet's 100-day Action Plan, visited TAI facilities to conduct on-site observations of activities related to the defense industry in the action plan. The Hürkuş project was initiated under the leadership of the Undersecretariat for Defense Industries (SSB) to meet the needs of Air Force Command and to develop a training aircraft that could enter the world market. The first test flight of the B configuration, which will serve as the basic training aircraft for the Turkish Armed Forces (TSK), was held in January. Once the first aircraft is delivered in November, it will be tested by air force pilots and subjected to various assessments. In this period, which is expected to last three months, improvements related to the aircraft will be finalized in cooperation with the air force and the TAI. Aircraft deliveries will be carried out systematically, and 15 aircraft will be delivered to the air force in the first half of 2019. Hürkuş will be the first national aircraft designed and produced by the company and included in the inventory. Following the development of the Hürkuş-A for civilian use, Hürkuş-B's features and dynamics were renewed. Hürkuş-B is 100 kilograms lighter than the Hürkuş-A, standing out as a faster, more modern and powerful aircraft. This variant was designed as a more stable and more comprehensive vehicle. Praised as the best in its class, the Hürkuş-B is equipped with systems similar to those in fighter jets in terms of its digital cockpit, pressurized cabin, ejection seat, oxygen support and landing gear. During his visit, Oktay was later briefed by TAI General Manager Temel Kotil about the domestic T-625 general purpose helicopter which performed its first flight on Sept. 6, ATAK, the original ATAK-2 helicopter, HÜRKUŞ, ANKA, the national fighter jet and other projects. Oktay also visited the assembly line of the domestically-produced T-625 Multirole Helicopter, which is due to begin serial production in 2021, and sat in the cockpit of one of the aircraft. Pilot Arif Ateş briefed the vice president on the helicopter's first test flight successfully carried out on Sept. 6 – a date set by President Recep Tayyip Erdoğan five years ago. Oktay highlighted the fact that the products, whose every detail from A to Z was designed and manufactured by Turkish engineers, were assembled here. "Every project conducted here is here because of your great effort, endeavors and craftsmanship," Oktay continued. "With these products, not only are we satisfied with our own needs, but we are also within a structure to meet the logistic needs of the TSK. You are the main pillars of this structure. I am proud and honored to be here with you."